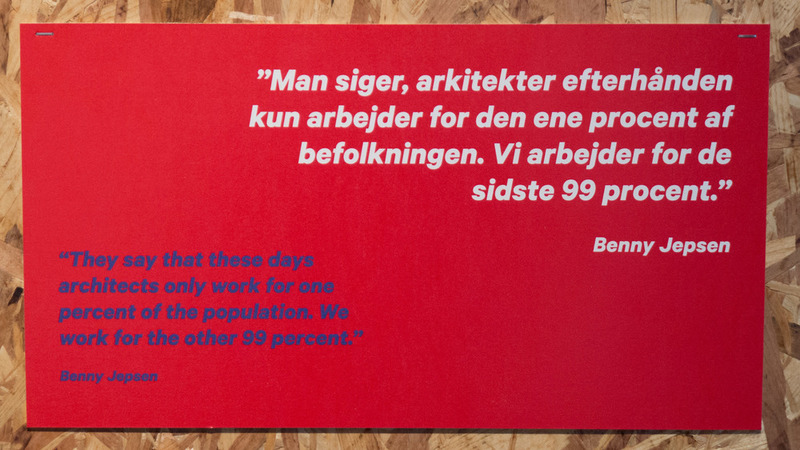 This is a significant and inspiring exhibition at the Danish Architecture Centre in Copenhagen that is primarily about the importance of community involvement at all levels in our cities - from making them really work day to day at the street or district level right through to being involved in major planning decisions. 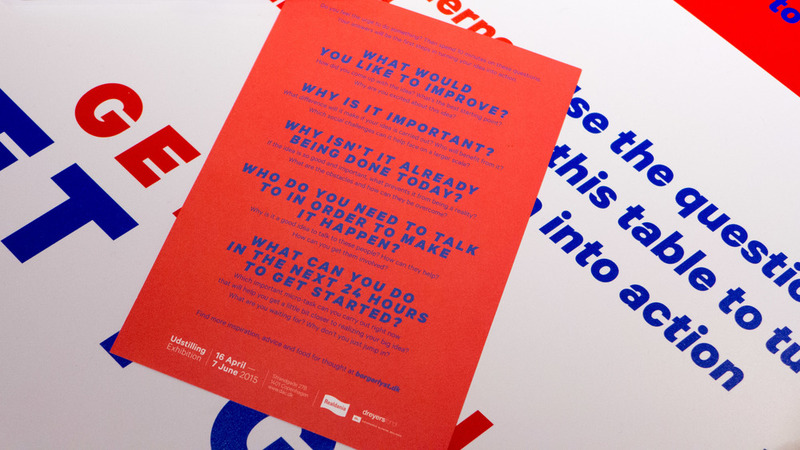 This is very much an exhibition for the digital age in which we live: an exhibition about ideas - rather than a gallery exhibition about beautiful objects that you simply admire. There are no objects as such here but bold and, in some cases, provoking quotations from planners and politicians; information panels about specific community projects and plenty of audio visual screens where you can listen to interviews or commentaries about specific community projects. As someone trained in museum work it was interesting to see how all this material was deliberately presented in a way that might not work in a printed book or, particularly, how it might not work if it was simply out there in the data world on a web site reached through a url. Here visitors are encouraged to explore but there is never-the-less a clear sense of a route or progress through the material that you still cannot really control as people click and move around or quickly click on from an on-line site. 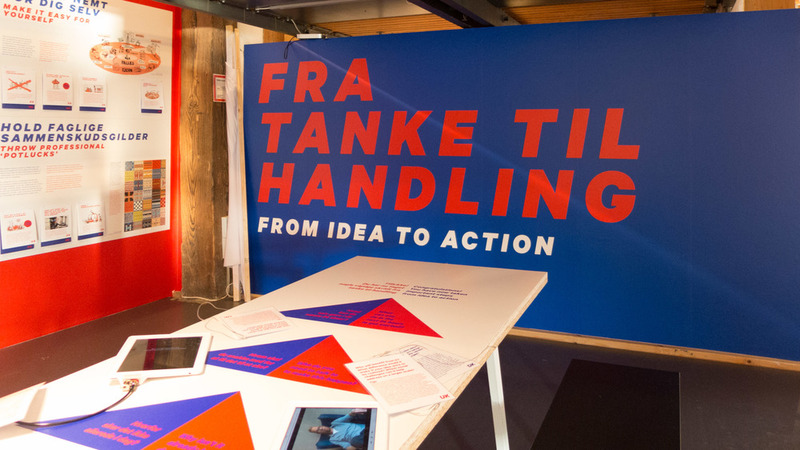 There are information panels about a wide range of community-led projects including Østergro - the community gardens of the Østerbro area - the community shared ownership scheme of Den 3 Revle - the Third Bar - in Nørrebro and the Restaurant Day project. There were also a number of international projects shown here including the amazing project to paint the houses of the Rio favelas, the success of the High Line in New York and the project to convert car parking spaces into community parks for a day with people moving in fake grass, plants in tubs and seating to reclaim a stretch of kerb. There are significant planning projects here - for instance trying to involve as many people as possible as Odense grows rapidly from a small city into a major conurbation. 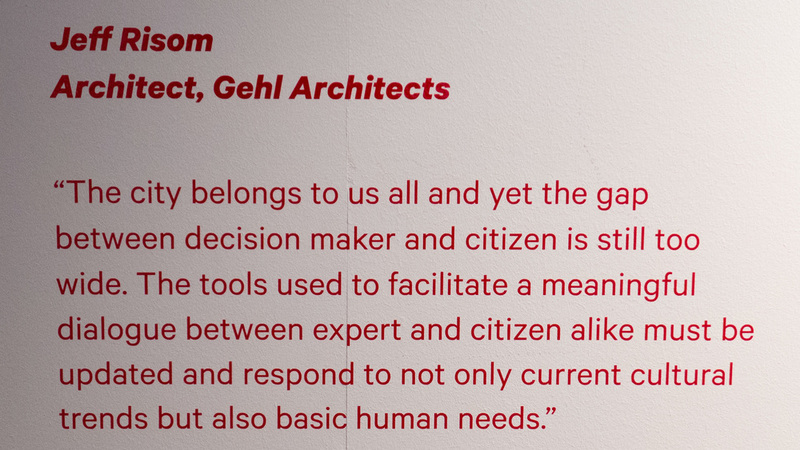 Some information surprised me … I had not realised that community involvement in planning has been enshrined in Danish law since 1970. All the main panels are in English as well as Danish so with no Danish I could follow everything well but where I missed out of course was my usual trick in a museum of listening in to the conversations of other visitors to work out just how they were responding to what they were looking at to find out if they were inspired or if they disagreed. 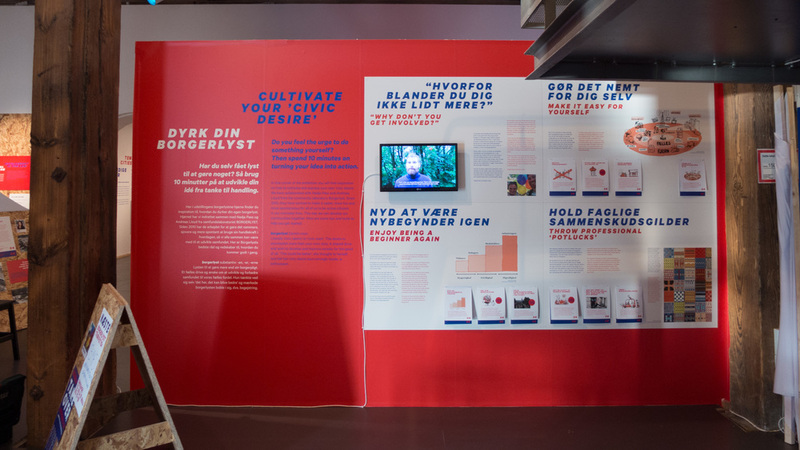 The last section of the exhibition has information about Borgerlyst (Citizen's Desires ?? ... wishes sounds rather feeble and wants too needy as a translation) set up by Nadja Pass and Andreas Lloyd to use their experience from various community schemes to encourage and nurture action groups and there is a long table with benches on either side that takes you through a question-and-answer sequence to see if you have an idea for a community project and to encourage you to take it forward. 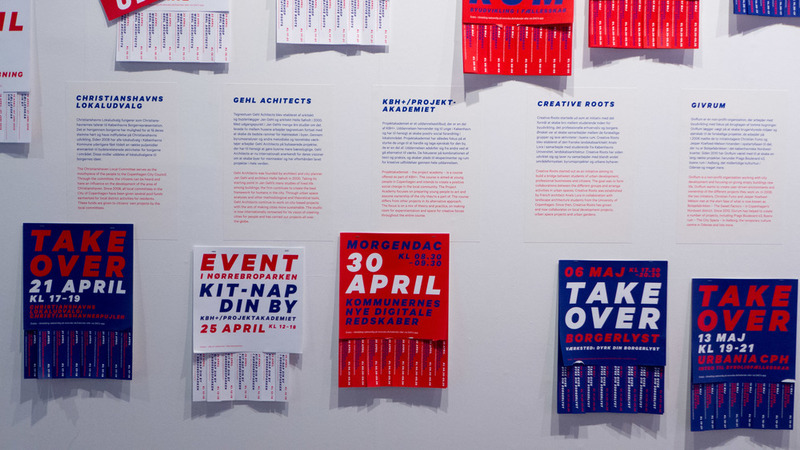 There are a large number of events associated with the exhibition and the last wall has bright bold graphics setting these out with tear-off strips for contact telephone numbers. Even in Denmark there must be rapacious developers whose primary aim is profit and there must be politicians or administrators reluctant to relinquish power or influence and of course there are citizens who don’t have the time or the energy to get involved or feel slightly in awe of officials and think that planning or decisions about architecture and redevelopment in their city should probably be left to the experts but my strong feeling is that, here in Denmark, that gap - between wealth and power and the majority of people who actually live and work in the cities - is actually smaller and more easily bridged than in most cities in the World. My only real concern is just how wide an audience will Co-create reach? I can see that actually having the material there and visitors having made the effort to travel to the Centre they want to focus on the material. But the number of visitors seemed relatively small and were all the usual suspects - trendy middle class families, men who were clearly architects and designers and a good number of students presumably studying architecture or design. How do you reach a wider demographic with something as important as this? Having said that, special events held around the building and on the quay outside have clearly been well attended. But overall it really is inspiring to see how many people have become involved over such a wide range of projects and have made a substantial and real difference to their urban environment.